Firstly, a short apology to you and a self-adminstered rap on the knuckles for me, for the shocking state of neglect in which I’ve left the blog lately. I’ve half a dozen semi-structured posts in drafts, but a busy schedule of commitments over the past few months (most notably, helping to get the new Mayo supporter’s group, Club ’51 off the ground) has ensured that most of my writings lately have had a distinctly sports-flavoured theme. Anyway, here’s a piece I wrote for the lovely folks in the Mayo News during the week, about looking forward to the 2014 GAA Championship, and our upcoming trip to the Big Apple to play New York GAA in the first round. Enjoy, and normal service will return soon. Now that the long evenings are kicking in, the dark days of winter are starting to feel like a distant memory and with them, the deflation of last September’s All-Ireland defeat. I don’t know about you, but that winter felt like a hell of a long one. The last time I had the pleasure of writing for this fine publication, I was scribbling in feverish anticipation from exile in Dublin just before the final. The spirits were high, the dream was alive and I was harbouring gleeful fantasies of watching the next-door neighbours whipping down the blue flags in disgust (SIX of them, no less) while we painted the street green and red. Thankfully, we’re emerging from hibernation. The neighbours have finally taken down the blasted bunting and washed the blue paint off the cat. After a roller-coaster of a league, the Green and Red Army are cranking up the engine for another shot at the big one. And what a beginning we have in store. Mayo’s Championship adventure begins, not in the salubrious surroundings of Hyde Park or Pearse Stadium, but smack bang in the middle of the Big Apple. 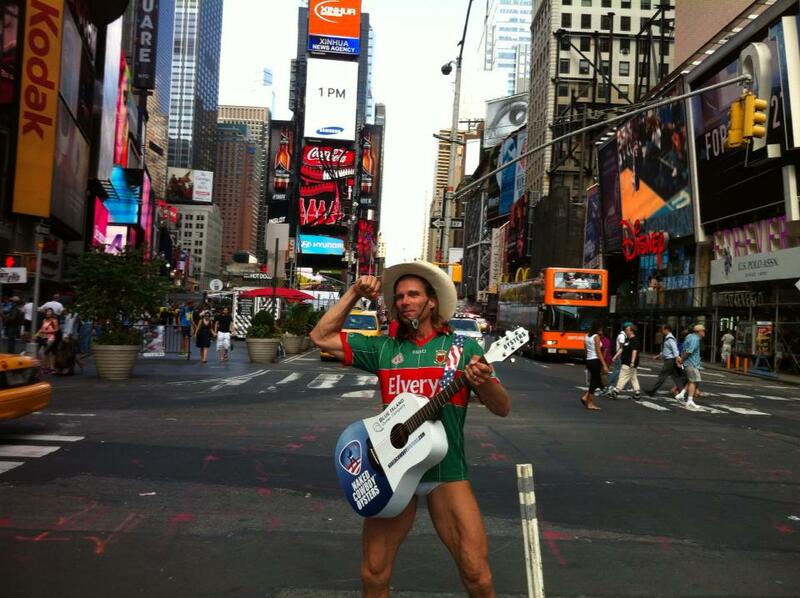 As away games go, it’s a bit of a stretch, and a long way from McHale Road, but the Mayo faithful are taking it in their stride and are decamping in their droves to NYC for the May bank holiday weekend. And in their hundreds they are going. Down west for Easter, I ran into a few familiar faces from the schooldays around Ballina. Nearly everyone I met had the bag packed for the Bronx. Some, I suspect, might have difficulty telling their free-ins from their free-outs, but they’re coming along for the party regardless. It’s curious, for a county that still feels the effects of the downturn more than most, but where Mayo football is concerned, being sensible is scoffed at. The New York fixture has been on the cards for a while, and for many, this is the holiday of a lifetime combined with the love of a lifetime. So you can bet your bottom dollar (see what I did there?) that the piggy banks have seen serious action over the past few months in order to make this trip a reality. And given GAA President Liam O’Neill’s recent remarks on the future of New York in the Connacht Championship, it’s possible that this could be one of the last opportunities we get to see Mayo play in Gaelic Park. So there’s a sense of Carpe Diem around this one. For New York GAA, meanwhile, this is the culmination a year’s worth of hard training. Unlike others in the Championship, they don’t have access to the back door. It’s do or die for them on May 4th. This is as good as it gets, and you can be sure they will pull out all the stops to greet Mayo, both on and off the pitch. Behind the scenes, in the dark days of winter, encouraged by the defiant determination of James Horan’s camp, the faithful were galvanising themselves for another year. One of the results of this was Club ’51, a supporter’s club set up by the fans for the fans, to get behind the team. The club quickly grew legs, and as well as providing practical information on where to park your car at an away game, it has proved a lifeline (some might say a support network) for those of us suffering the hangover of a disappointing September. Being involved in the club has demonstrated to me beyond all doubt the resilience, the optimism, the sense of fun but mostly the proud, infallible spirit of the Mayo people when it comes to football. Club ’51 is embarking on a mission to demonstrate just how far-reaching the Mayo support is, and planning to send a flag on tour around the world to be photographed with fans in all sorts of far-flung places. The first stop on that journey is New York.The authorities have been alerted, the hatches have been battened and the Naked Cowboy will be naked no more, but clad in Mayo’s finest cloth. We’ll be painting the town red … and green. May the 4th be with you. New York, we’re on our way. This post was originally published in the Mayo News on Tuesday 29th May, 2014. 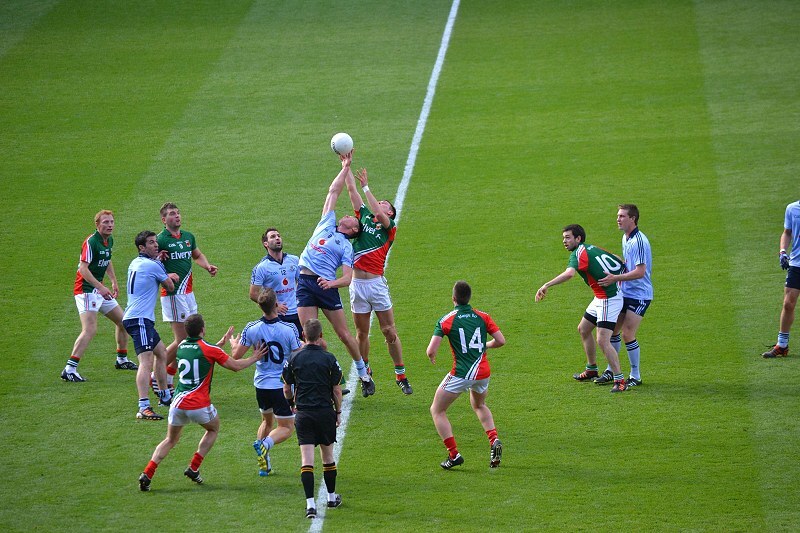 Another piece I wrote for Balls.ie in the aftermath of Mayo’s heartbreaking defeat to Dublin last weekend – you can read the original here. It’s Tuesday, and the dust has finally settled after another All-Ireland final weekend. It’s funny. You spend so long in the weeks leading up to the big day fervently wishing the hours away, only for the day itself to pass you by in a whirlwind of colour, noise and crowds. Before you know it, the final whistle has gone, and – if you’re from Mayo – you’re left reeling once again with the bitter, stinging slap of loss. It’s hard to write this. It’s not what I anticipated writing in the aftermath of Sunday’s game, and it’s difficult not to resort to tired old clichés in an effort to describe once again the pain of losing. After all, it’s not the first time we’ve been here. There’s nothing really new to say. Apart, of course, to heartily congratulate our Dublin friends on their deserved win. It wasn’t pretty, it wasn’t as stylish as it could have been (despite valiant efforts by Aidan’s Fringe), but once you have Sam in your possession, none of that really matters. Winning is everything, and our opposition proved that, once again, they had just a little more in the tank than we had to finish the job. While there is plenty of controversy to debate in the aftermath, no right-minded sports fan would begrudge this excellent Dublin team their victory. I was right about one thing, though. This year was different. In terms of the belief Mayo brought with us to the final, our approach and our defiance, throughout the year, Mayo held their heads high and fought to the end. From Friday evening, the colours started appearing around the city. Saturday, we grew in stature and early on Sunday morning, the city was ours. This was a build up like nothing I have ever experienced, full of promise and anticipation. The welcoming home of friends and family from across the miles. The meeting and greeting old friends and new. That belief carried us into Croke Park from 12.30pm on Sunday, through the ecstasy of a superb victory for the Mayo minor team, who brought the Tommy Markham cup home for the first time in 28 years, right through to the end of the senior final, where we just failed to cross the line. So near, and yet so far. While the hurt and frustration of knowing that this was a final we could have won but left behind us, will linger for a long time, the sense of pride and belief we feel in that panel of players and management will not waver. They’re our own, and they are hurting far more. So yet again, in Mayo we turn our thoughts to Next Year. We’re getting closer, all the time. It’s suggested that there are five stages of grief after a terrible event. Denial, Anger, Bargaining, Depression and Acceptance. From what I’m reading and hearing, it’s probably fair to suggest many Mayo fans have incredibly, already raced through these stages and are dusting themselves down and steeling themselves for next year’s battle. The pace of recovery is rapid, but then, we’ve had plenty of practice. After the game, a few of us took ourselves away from the madness of Drumcondra to seek some solace and escapism on the south side of the city. As we sat in a burger joint trying to come to terms with the loss, black humour won out. We debated storming the pubs and clubs in a conga line of celebration. Pretend we’d won the damn thing anyway, ignore the dissenters and party like it was 1951. If we were going to lose our minds following Mayo GAA, we may as well do it properly and get a decent night out of it. (We didn’t.) Sam Maguire, we also concluded after an in-depth analysis, is like that certain someone you’re really into, but who’s blind to your existence. Instead, he’s blinded by the glamour of the more … forward counties. The Kerrys and Corks and Tyrones and Donegals and Dublins with their flashy tans and flashy forwards. Oblivious to the charm of the quieter, more reticent but infinitely classier Mayo. Sam’s loss, we concluded. Anyway, if we finally got him, would we really want him in the end, after all that, we wondered? He strikes me as a bit high-maintenance, if I’m honest. All that polishing, and stuff. Anything to raise a smile. As with a real-life tragedy, humour is a healing balm. We’ll keep trying. And one glorious day, we won’t fail. 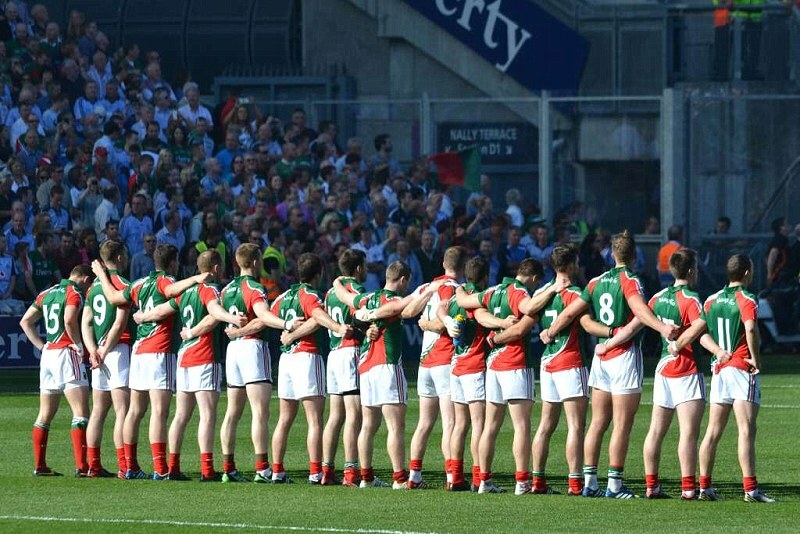 In what’s proving to be an interminable few weeks for Mayo GAA supporters, here’s a piece I wrote for the folks over at Balls.ie during the week about the build-up to the big match. Original link: http://balls.ie/gaa/mayo-dublin-preview/ Enjoy! Ten days and counting. Ten interminable nights of feverish tossing and turning and dreaming. Dreaming of Sam. Will James start Andy? Will Cillian’s shoulder be match fit? Will Ger Caff’s defence put manners on Bernard Brogan’s attack? Can Al Freezer replicate his magnificent performance of August 25th? Will the man in black, Joe McQuillan lend the Dubs a helping hand? Most importantly, will Aido’s Fringe once again defy gravity and last the pace? These are just some of the many questions occupying the minds of Mayo GAA supporters in the lead-up to the All-Ireland Football Final on September 22nd. We’ve been here before. Oh yes. For the uninitiated, this will be Mayo’s eighth appearance in an All-Ireland senior final since 1989 (infamous ’96 replay included). We’ve gone home empty-handed seven times. We’re no strangers to the pre-match build-up. We know how to decorate a town, make a decent round of sandwiches (that will last us ‘til the breakfast in Feerick’s) and paint a car or sheep or two. But despite some decent efforts, we’ve not seen Sam Maguire since 1951. And we’ve fallen down disappointed, and picked ourselves back up, year after year. This year feels different, somehow. There’s a new air of confidence in Mayo. Instead of apprehension, there’s expectation. That this is our time; that we can do it this year. It’s hard to explain. For a long time – probably since 1996 – there’s been a certain fear associated with Croke Park on All-Ireland day. Lots of talk of the so-called “Curse of ’51” (a tale which is tenuous at best, but eternally tedious).This year, it’s different. We have a team that’s proved itself ruthless, creative and mentally strong. A team to believe in. And for the first time in a while, there’s a tangible sense of belief in the county that this is finally our year. Now or never. There’s probably no senior football team in the country that has ever carried this weight of expectation in to a final. It’s a huge burden to place on the shoulders of a young team. But that’s Mayo for you. Always demanding, never losing faith. Mayo, for all its rugged beauty, has its problems. It’s been hit hard by the economic crash, and emigration and unemployment remains high. It has one of the highest suicide rates in the country. But there’s an extraordinary, fierce sense of pride in the county. Football is more than just football in Mayo. It’s in the blood. It’s transcends the bad stuff, and brings people together. It’s all-consuming; this week, if you’re not talking football in Mayo, you’re not talking. And Mayo badly wants the win. So once again the flags are flying high, the cars have been spray painted, the Mayo songs are peppering the airwaves fourteen of them at last count) and the sheep are green and red. There’s a sense that this time, it will be different. And there’s the ticket hunt. It’s an eye for an eye and every man, woman and child for themselves. Grannies for sale all over the shop. “Any tickets?” is the current refrain on all Mayo lips, regardless of whether you’ve gone to buy a loaf of bread, open a bank account or get a tooth out. No-one wants to miss this one. Desperation is growing by the second. Begrudgery reaches new levels in the ticket hunt. “Sure that wan will have no bother getting her hands on a rake of tickets. Wasn’t her husband’s aunt-in-law’s brother on the county board for years?” Rumour has it the queue for the ticket draw outside Ballina Stephenites started back in late August, with some of the returning semi-final support only stopping off at home for a flask of tea and the sleeping bag before setting up camp in the stand. Willy Wonka’s ticket hunt had nothing on Mayo’s. Expect bloodshed. And what of the opposition? Well, they’re fierce quiet altogether. A Dublin team within a sniff of a final usually guarantees a minimum three tabloid pages daily, with a souvenir poster every Wednesday and enough car stickers to wallpaper the SUV with. This year, the Dubs are conspicuous by their silence. One suspects they’re happy to watch the Mayo hype machine march on, while they do their own thing in the background. Living in Dublin, I’m onto their plan. The only flags in south Dublin suburbia are green and red, and there are no round bales or sheep painted blue in the immediate vicinity. Only stickerless SUVs. One would think South Dublin didn’t even know there was a final coming up. Very odd, altogether. Out and about in Dublin, however, there’s a bit more happening. Car flags are an instant source of solidarity on the roads. A lady I met almost drove over a dog (and its owner) last week in the SuperValu car park, such was her eagerness for a car flag high-five. Dublin taxi drivers in particular love the old car flags. The day Dublin played Kerry, I was stopped at the lights at O’Connell Bridge, the red and green on display, when a blue-jerseyed taxi driver across from me motioned for to roll down the window. “Who d’ya think will win today?” he bellowed across two lanes. “Who do YOU think will win?” I shouted back, deflecting the question, Mayo defence-style. “Jaysus”, he said. “I hope Kerry do. Better for business later!” And with that, he sped off, with a friendly beep of the horn and flutter of the flags. Top fella. So with ten days to go, there’s nothing to do but wait. Wait, and dream, and analyse, and debate, and argue, give out about the county board hiding the tickets and dream some more. Anything to quell the nerves and make the day arrive faster. Maybe light a few candles and say a few novenas that a ticket will appear. And say a few more that this time we’ll finish the job. It’s now or never. Maigh Eo Abú!